Nyla blinked awake, yawning before she realized something was....off. Her senses were working just fine, and she wasn't able to put a finger on it until she saw the old wizard standing nearby with a smile on his face. Smile....That was the word, correct? Her mind raced, processing all the new information flooding in that replaced her simpler feline mind. "Are you okay?" The wizard asked, eyeing her carefully even if the smile still played on his lips. I will be....I think. Nyla stopped, realizing that he'd actually been able to hear her thoughts based on the shift in his body language. "Good. I know this is a bit of a shock, what do you remember?" He stayed seated, not yet daring to reach out for her. I remember.....You were working on something. I jumped up on your shoulder to get a better look and rub my scent on you. Nyla was still coming to grips with the fact that she could actually understand his words now, they weren't just garbled bits of another language she did not speak, and he could hear her thoughts as clearly as if she was making the same noises he was in the same manner of understanding. "Yes. A spell that I'm afraid backfired quite a bit. You were affected as well, I scoured through all my books for research while you were unconscious to figure out just how. Essentially you have been given intelligence equal to my own which is far beyond your feline instincts. All these years that you have been my companion and watching my work that magic has been slowly saturating your small body, but that spell was the last tipping point. It is that magic that is allowing you to truly understand my words and allows for me to hear you in my own mind as if you were speaking to me." The wizard explained as best he could, remaining calm despite Nyla's clear display of agitation. You speak as if you knew this would happen. Or at least had some indication it would. Her fur puffed up, back arched as her eyes scanned his face for the little signs she now had a much greater understanding of. "I did, yes. When I took you in as a kitten I knew that my magic would change you over time, as it does to the non magical familiars to all magic users." He shook his head. "I do not expect you to understand, nor do I expect forgiveness. Your mind is awash with new things that have come on very suddenly. Should you wish to leave, or to find somewhere to hide until you can come to terms with it, I will not stop you." The wizard stood up, dusting off his robes as he left Nyla on the floor of the little bedroom they shared. Nyla wanted to say something in response, but she could not find the words for it. Instead she retreated under the wizard's bed, just a simple thing made of wooden supports with straw and fur blankets, to her favorite back corner where she liked to drag her own blankets and other soft things to curl up in and did just that. Are you sure you're not crazy? Her telepathic voice called out to him, knowing somehow that he would hear her. Maybe I am, but I hope you will not mind. And perhaps that you will not blame me too much. His voice echoed in her head the same way, along with a slight chuckle that made Nyla roll her eyes and scoff. I am not even sure what I am now. Though I suppose I will have to get used to it. She sulked some, finding comfort in the familiar scents of the blankets and their softness against her fur. A grimalkin, technically. You are not the first of your kind, nor will you be the last I suspect as long as mages continue to keep feline familiars. The wizard answered her, shrugging even if Nyla couldn't see it. When you are ready, if you ever are, I am still here for you. And now you can have a greater understanding of my work, if you desire. He added, going back to a bit of spell preparation. 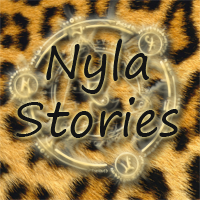 Nyla remained silent, her tail flicking in irritation as she sighed and settled in to think. Something she wasn't entirely used to, as there had always just been the instinct there and now a whole new realm of thoughts and feelings and possibilities had opened up before her. She wasn't sure what she was going to do about it, or about her sudden understanding of the world in what she assumed was the same way the wizard saw things, but the only cure for that was time so she let herself have it as she mulled over everything and watched the shadows cast from the mage lights on the walls, listening for the steps of the wizard as he paced back and forth and trying to find normalcy in the familiar sense of that much at least for now.